Tucson is home to the Ettore “Ted” DeGrazia Gallery, maintained by the DeGrazia Foundation. We were thrilled to get to visit the historic site where the artist lived, worked and built a chapel! 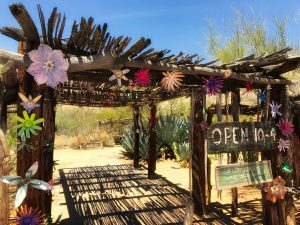 De Grazia hand built the adobe brick buildings on the 10-acre site. The Mission in the Sun was built in 1952 in honor of Father Kino and dedicated to Our Lady of Guadelupe, patron saint of Mexico. his studio after a mine. Walls of the studio are constructed of mud and straw which he said created harmony. The floors of the studio are cactus cut into slices and inlaid with turquoise and other stones. There is a garden courtyard and even the ladies’ restroom has original DeGrazia paintings! To protest inheritance taxes on works of art, DeGrazia hauled about 100 paintings on horseback to the Superstition Mountains near Phoenix and set them on fire in 1976. Needless to say, newspapers like The Wall Street Journal and People Magazine carried the story and DeGrazia became an even bigger legend. DeGrazia died in 1982. Not to know a rule in art and break it is bad art, but to know a rule and break it is good art. Only by knowing the rules and breaking them will one develop individual style.